The 20V Switchdriver power drill holds multiple bit pairings so you get your work done twice as fast, with half the hassle. No more fumbling around for loose bits. Just give the head of the cordless drill/driver a quick twist and switch from drilling to driving in an instant. And since the Switchdriver drill is part of the 20V Power Share platform, you can share batteries with other 20V WORX tools you already own, saving time and money. Drill like a pro thanks to the 2-speed gearing of the wireless drill that delivers the speed and power you need to tackle any project with ease. The two 1/4" chucks on the screwdriver rotate 180° clockwise or counterclockwise with a push of a button, so you can switch from drilling to driving in an instant. The compact and lightweight Switchdriver drill is equipped with electronic torque control which prevents your screws from stripping and eliminates any potential damage to your work surface or materials. The Switchdriver&apos;s two ¼" chucks rotate clockwise and counterclockwise 180° with the push of a button so you can move through projects quickly with a single handheld power drill — no need to swap out tools mid-job. Select the screwdriver drill and driver bits you need for your specific task and have them loaded and ready to go — no fumbling around for loose bits. The electronic torque control of the 20V cordless drill helps you manage force to eliminate stripped screws and limit potential damage to your work surface and materials. Our powerful, efficient 20V MAX battery powers the Switchdriver cordless drill/driver and the entire Power Share platform of yard and power tools. Illuminate your work area with the trigger-activated LED light placed directly on the Switchdriver handheld power drill so you have ideal visibility under any working conditions. The 20V Switchdriver wireless drill/driver lets you power through projects without stopping to grab another tool or even fumbling with loose bits. Just drill your hole, switch chucks with the push of a button, and the 20C cordless drill can drive your screw. Keep it moving! At just over 3 lbs., the 20V Switchdriver cordless drill/driver is compact and lightweight for better control and less fatigue while working. The rotating dual chucks of the screwdriver drill make switching between bits faster and smoother than ever. The Switchdriver’s electronic torque control helps eliminate stripped screws and limits potential damage to your work surface and materials. This is a handheld power drill for delivering clean holes and ample driving power every time. THE 20V CORDLESS DRILL THAT HANDLES ANY JOB, NO PROB! The Switchdriver cordless drill/driver is powered by a 20V MaxLithium battery and features variable 2-speed gearing to tackle all common drilling and driving applications. Dial up the power you need on the switch drill for the task at hand. The Switchdriver cordless drill has a lightweight and efficient 20V MAX Lithium battery that’s shareable among our entire line of 20V DIY yard and power tools, saving you time and money. That’s Power Share™, only from WORX. Yes, this model includes 2 batteries and one charger. How heavy is the WORX Switchdriver? The WORX Switchdriver is surprisingly lightweight for the power and torque it delivers. Even with the battery installed, it only weighs 3.1 lbs, making it the perfect tool for everyone from the at home DIY’er to the contractor who takes it to every job site. What kind of bits does the WORX Switchdriver use? The WORX Switchdriver uses standard 1/4 inch hex bits. You can use any standard 1/4 inch hex bits you already have, or purchase bits from your favorite retailer. What kind of chuck is on the Switchdriver? How do I change bits and tighten them? The WORX Switchdriver features the innovative rotating chuck that allows you to use two different bits at the same time and switch between them one-handed. Our quick release chuck is like another pair of hands – just pull the collet locking sleeve on the chuck (away from the tool), insert the bit and let go of the collet. That’s it! Your bit is already perfectly seated and tightened. To remove the bit, pull the collet locking sleeve away from the tool and remove the bit. It’s that simple. What is the difference between the two chucks of the Switchdriver? The two chucks are functionally the same. The chuck on the WORX Switchdriver can be changed with one hand. How does that work, and will it turn while I’m trying to work? The innovative chuck on the WORX Switchdriver was designed with convenience in mind so you can get the job done instead of wasting time changing bits. To rotate the chuck, squeeze the red dual chuck release button over the on/off switch on the Switchdriver. While holding it down, rotate the chuck until it clicks into place. Many people use their thigh or forearm to turn the chuck while keeping one hand on the work. For your safety, the Switchdriver on/off switch will not operate until the chuck is clicked securely into the correct position, which will also prevent it from accidentally turning while in use. Always make sure the chuck has “clicked” into place before using the tool. 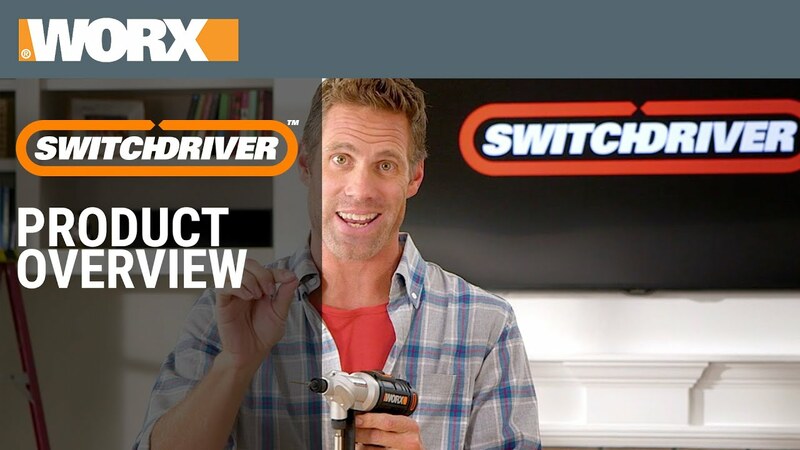 The video shows that the WORX Switchdriver is variable speed. How do I control the speed? The speed of the Switchdriver can be controlled two ways. On top of the unit, there’s a two-position switch for selecting a low speed setting (providing more torque for drilling, difficult materials, or long bolts), or a high-speed setting (less torque for lower resistance jobs, like installing screws in pre-drilled holes). Additionally, the on/off switch is pressure sensitive to determine how fast the WORX Switchdriver operates. The more pressure, the faster the speed. There’s a red dial just above my battery. What is this for? The red dial on the WORX Switchdriver is an electronic torque adjusting dial. Torque is a measurement of turning power. Switchdriver has about 265 inch-pounds of torque, which is excellent for drills of its size and class. The electronic torque adjusting dial allows you to control how much turning power your Switchdriver will exert and whether the electronic clutch will be applied during the task. What is the electronic clutch? Drills have clutches in them to prevent over-driving screws. Most drills use a mechanical clutch, but Switchdriver has a clutch controlled by an electronic PCB. Set the clutch on a low number when screws are small or soft and cannot handle a lot of force put to them. For big fasteners, or tough materials, set the clutch on a high number. If the screw drives too far into wood, or breaks off, set the clutch to a lower setting. If the screw will not drive flush with the work surface, increase the clutch setting. Setting the clutch requires some trial and error. If possible, practice on a scrap workpiece first. The manual shows bits/parts I didn’t receive with my tool. Was something left out of my package? Not necessarily. Different packages contain different items. To be sure you’ve received everything, be sure to look at your model number in the “accessories” chart in the manual. Our 16 and 67 piece kits will include a variety of bits for everything from drilling to driving. And if your kit doesn’t come with a particular bit you need, you can use any standard 1/4 inch hex bits in your Switchdriver. How long can you use the WORX Switchdriver on each 20 Volt Max Lithium battery charge? Runtime will vary from job to job, and sometimes between users, depending on how each person works. To maximize the runtime you get out of the battery, use the appropriate speed for the job at hand. The lower speed settings deliver more torque for jobs that need more power, and higher speeds provide lower torque for jobs with less resistance. Since most jobs will require different combinations of speed and torque and lower and faster speeds, actual runtime results will vary. The battery included with your Switchdriver will take you far, but remember you can also use the 20V Worx batteries you already have so you’ll never be out of power. I’m a homeowner, what can it do for me? The Switchdriver can handle just about any job you throw at it. Because of the light weight and compact size, it is excellent for jobs like hanging blinds, curtain rods and pictures. But there is plenty of power to handle driving deck screws or mounting hardware in brick or masonry. With two speed settings, the Switchdriver can drill everything from soft wood to hard metal. Almost any job involving driving screws into wood will have a better result if there is a hole predrilled for the screw. Predrilling helps the screw’s threads cut into the wood easier, so less force need be placed on the screw. The lower force helps prevent the wood from splitting, keeps the screwdriving bit from slipping and damaging the screw and aids in driving a screw straight. I’m a remodeler/contractor, what can it do for me? The Switchdriver can tackle just about any job a standard 20V drill can. Because of the compact size, the Switchdriver can fit into tight spaces that other drills cannot. And the light weight reduces the fatigue of fighting a heavy drill. Jobs involving repeated bit changes get done much faster because the bit change process is streamlined. Many people hold the work piece and fastener in one hand, predrill a pilot hole then drive a fastener with the Switchdriver in other hand. The release button for the dual chuck is close to the trigger. Depress the release button then turn the chuck by pushing it against a firm surface. Many people use their thigh or forearm to actually turn the dual chuck. What are the drilling capacities of the Switchdriver? In wood, maximum recommended hole size is 1-3/16”. Avoid drilling holes larger than 3/8” in metal. Yes! With Powershare, you can share the battery and save money. Your WORX Switchdriver can use any WORX 20V battery you already have. By sharing the battery between tools, you’ll always have the power you need to complete any job. Check out the full line of 20V PowerShare tools here. It takes approximately 3 - 5 hours to fully charge the battery. While Powershare allows you to share batteries between tools within the same voltage family, batteries should only be used with tools of a corresponding voltage. Use your 20V Max Lithium battery with any 20V Worx tool – even the garden tools – but save your 32V battery for your 32V tools. The flashing LED light indicates the battery charge is getting low or the battery power is interrupted. There is a built-in overload protection that will stop the tool if the battery is suddenly put under too much strain. This feature protects the battery so it will perform a long time. On rare occasion, the Switchdriver will stop itself momentarily if the job application drains power too quickly. Simply release the trigger to reset the driver. If problem persists, check that the speed selector is on “1”, which is the more powerful, though slightly slower, speed. I didn’t receive a manual. Is there anywhere I can get more information? You can download the manual here, check out the video below, or our friendly customer service team will be glad to answer any questions you may have at 1-866-354-9679 (WORX). Are there any precautions I should follow when using the WORX Switchdriver? Always wear the proper safety gear and maintain a clean, safe workspace. For more information, please refer to the owner’s manual. 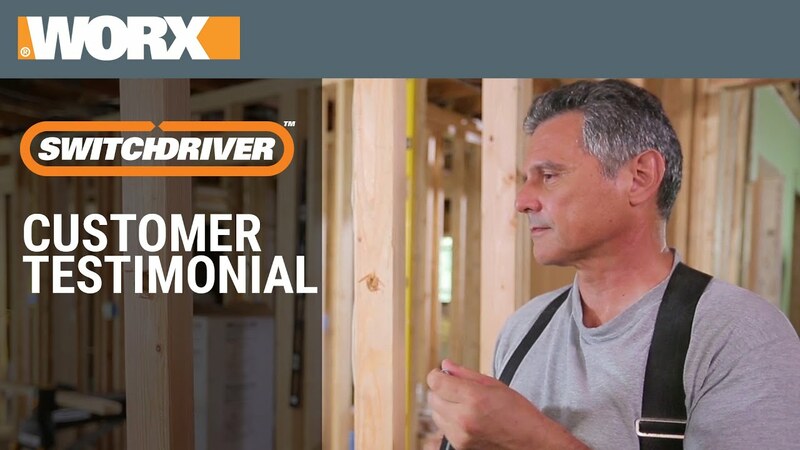 If you decide the Worx Switchdriver isn’t the right tool for you, we offer a 30-day Money Back Guarantee from date of receipt (less shipping and handling). Please call our customer service center at 1-866-354-9679 (WORX) and we’ll be happy to assist. View more information here. We know your tools are indispensable, so we cover each tool with a 2 Year Limited Consumer Warranty. You can extend your warranty to 3 years by registering online within 30 days of purchase. Already have your Switchdriver? Register now! Many accessories are available online under Accessories. If you don't find what you're looking for, our friendly customer service team is ready to get you back up and running. Give us a call at 1-866-354-9679 (WORX). "Looking for something special for him? 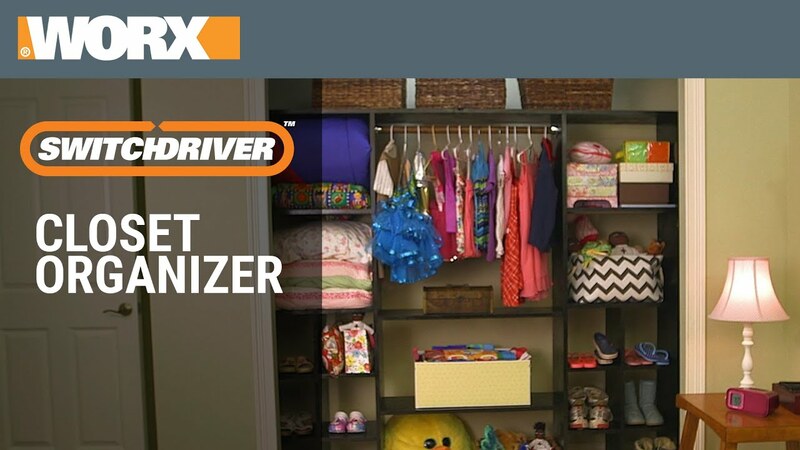 The TODAY Show features some of their favorite new gift for Dads, boyfriends, brothers, and husbands including the WORX Switchdriver 2-in-1 Drill & Driver!" "The Switchdriver is a cordless drill/driver with two spring-loaded 1/4-inch chucks, one for a drill bit the other for a drive bit. Click in whatever hex shank bit will do the job, drill, then simply turn the nose assembly to the next bit and drive. It’s a great idea that demonstrates fresh thinking about how to handle this common two-part chore." 20V Switchdriver 2-in-1 Cordless Drill & Driver is rated 4.7 out of 5 by 1001. Rated 5 out of 5 by Debbiebix from Steppung outside my comfort zone I purchased the cordless screwdriver/Drill after finding myself aging a bit and having a difficult time using manual tools. Being the wife of an active-duty man who is not around often, I’m finding myself having to do more small repairs with no idea how to do what I need to do. The cost of having a handy man help is adding up. So, I’ve begun purchasing the WORX products. They are easy to use and have instructions that explain at even a very basic level. While I’m sure some may roll their eyes at this lack of basic understanding, I’ll challenge any of those in a bread-making kitchen dual (lol). We all have our comfort areas. Thanks, WORX, for helping me step outside of my comfort zone and be successful. Rated 5 out of 5 by David1961 from Loves this Tool I bought this expecting to use often which it is, my Wife changes things Daily and need to hang pics. and anything else, I have used it multiple times and the Battery lasts, good tool, Thanks. Rated 5 out of 5 by Blind man from Light and powerful Finally brought this out on the job and it performed really well. Switching between pilot holes and screwing was a timesaver and dropped bits while switching! It is very light and I wondered about battery life and screw power but it has performed well. I’ve already shown it around to others who do the same type of install work. Rated 5 out of 5 by Mona Lynn from Love love love the Switch Drivet I love my switch driver so much I ordered this one for my sister who was in the market for a power drill. Rated 5 out of 5 by jennyfair from easy to use I have several Worx tools, I love every one of them and the gardening tools make my job so easy. Being 74 yrs old and a widow I have to do everything myself. Now saving up for the worx rable. Rated 5 out of 5 by Lisa Marie from The Switchdriver is by far the best Tool!!!!!!! This is by far my favorite tool. I have even purchased one for my sister. Genius tool! The Switchdriver is the most used tool in my household. Anyone who uses it, or sees mine want one! Rated 5 out of 5 by Grandma Barbie from Awesome tool!! I can’t believe it took me this long to find such a convenient tool!! Makes doing a project so much quicker without having to switch between the drill bit and the screw driver. Love it!!! Rated 5 out of 5 by Ckallanee from Awesome tool! I love this tool! Makes work so much easier! Rated 5 out of 5 by Eddie 70 from Absolutely great time saving tool. I have had my drill for three weeks. I use it every day on projects around the house. Have been doing a lot of work off a ladder and the Switchdriver saved me so much time not having to change from drill to driver. Also because of the Switchdriver my work looks a lot better for some reason. Rated 5 out of 5 by lesouth from So Easy I've had it a few weeks and used it to put up shelving in the utility room-wish I had bought it sooner.I'm physically challenged and this ended a lot of frustration.Would HIGHLY recommend to everybody! Rated 5 out of 5 by Mickey4788 from Great Drill/Driver I bought my drill/driver motor about 3 weeks ago and I'm very glad I did. and very pleased with my new drill/driver I give it 5 thumbs up ! Great work with this tool.....thanks a million.. Rated 5 out of 5 by Kshsh hmmm diue from The real deal Got this as a gift 2 Christmas ago. Have been using it all week, couple hours a day. Battery seems to last forever. Hanging light fixtures the quick switch from drill to Phillips driver while up on a ladder holding the light fixture with the other hand was fantastic. I also built a work bench. The tool drove 3" long 5/16" lag screws into 4×4s like butter. I highly recommend this tool. It is absolutely the real deal. Rated 5 out of 5 by V Ann from Gave this as a "gift" For years I have watched my husband juggling drill bits and screw drivers when doing a project. Problem solved! The tool is fairly light for 20volt drill and the battery can be used with our other WORX tools. Great idea! Rated 5 out of 5 by corkymantle from Fantastic tool Got this for Christmas last year and fell in love with it the first time I used it! It is soooo nice to be able to switch back and forth from drill to driver with no hassle what so ever. This switchdriver came with 2 batteries, but the battery lasts so long, that one is sufficient for me! I like this product so much I gave one to each of my sons in law and know they will love it too! Rated 5 out of 5 by Nannygeo from Love this!! I absolutely love this tool. It is SO HANDY and easy to use. Make so many projects go much faster, when you don’t have to use two tool or switch bits! Rated 5 out of 5 by Doug Van Zandt from Excellent Product for Deck work! Saves time and ease in building Decks! Plenty of power! Rated 5 out of 5 by Dan the Light Man from Awkward jobs EASY! I bought this for my husband hoping he would like it and make honey do list jobs easier. He loves it. He has used it numerous times for various jobs around the house and always comments how easy this tool makes things. So we bought one for our son as a Christmas present. This is what you buy for the tool guy who thinks he has everything until he has this. Rated 5 out of 5 by Gelder from Fantastic innovation I have three of the switch driver 2 in 1 drills. Well I have two and the little wifie has one. I love the switching action and light weight of the 20 volt drill / driver. She likes how easy it is for her to handle , not all bulk and heavy. Very versatile, drill holes and switch and drive screws. I have six drills in my shop and this are, by far, my go to drill / driver, every time. Rated 5 out of 5 by Jack 007 from Love the easy use Yes I am happy, very happy I used it to install my Xmas decorations on the outside of the house. Rated 5 out of 5 by ChrisDC from Extremely handy This is just what I needed to save time drilling pilot holes then placing screws! Before, I had to drill the pilot holes, then hope they were all placed correctly, then switch bits, and then screw in the screws. Now I just drill the pilot, flip to screw, and vice versa. This works great, and the light with it is an added bonus to see what you are doing! Rated 5 out of 5 by Ope29 from Great Tool! The Quality is very Good! Easy to use the features on this Drill. Love it!